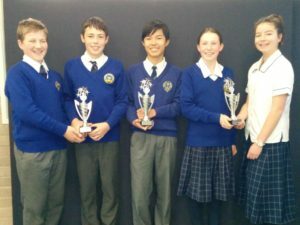 During Term 2, 2016 several high school students spent many lunch hours patiently growing Alum crystals, for the Crystal Growing Competition organised by the Royal Australian Chemical Institute (RACI), and the Faculty of Applied Science (UC). At the awards giving ceremony by the University of Canberra, trophies were presented by Professor Ashraf Ghanem for the best crystals in each year level. Congratulations to our winning students: Kiara & Savannah (Equal 1st in Yr 7), Joseph & Lachlan (Equal 1st in Yr 7) and Min (1st in Yr 9). 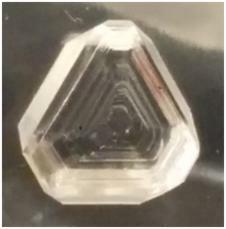 Shown below is the crystal grown by Min – greatly enlarged so that you can see the clarity!